Cards in sideboard not used: Deadeye Rig Hauler, Secrets of the Golden City, Pirate's Prize, Highland Lake (or whatever the U/R dual is), March of the Drowned, Nest Robber. Not sure if the build was right, since it's conceivable Nest Robber is better than e.g. Swashbuckling. Dire Fleet Poisoner is really good. It let me trade up so many times and still leaves behind a relevant body. There was even one time opponent triple-blocked my Fathom Fleet Boarder because that would've guaranteed it died regardless of what trick I had, and indeed it died, but all his blockers died too. Lightning-Rig Crew is also really good, it's often responsible for 8+ damage. In the one game I lost, I drew 11 lands and 5 spells, and my opponent was still one point away from dying because of the pinging from Lightning-Rig Crew. In fact I would've won if I'd just drawn a pirate to untap it. Forerunner was also great as a tutor with relevant effect. Not so sure about the Arsonist. I did win one game because opponent probably did not realize that you can sacrifice lands to Arsonist. On the other hand there was another opponent who sacrificed a land, then I recurred Arsonist with March of the Drowned, and he sacrificed another land, which might've mana screwed him. March of the Drowned was medium. The above game it recurred both Dire Fleet Poisoner and Arsonist and was excellent; on the other hand there were games when it was dead in my hand, and in the game I lost I was forced to use it on a single Wanted Scoundrels and that wasn't good. I suspect not using the second copy of March of the Drowned was right here. On to the next draft - starting with Bishop of Binding into Crested Herdcaller (over Moment of Triumph, Divine Verdict and Sun-Crested Pterodon). @Banedon: Yep, that deck looks really good. @Topic: I'm still a bit bummed out about my last draft. My deck was amazing, but I decided to keep it at 17 lands because of the many ways my deck could generate Treasures; and then I lost to manascrew twice and a disconnect once, which means that an absolutely bonkers deck with all of Etali, Primal Storm, Rekindling Phoenix, Captivating Crew and Kumena's Awakening only went 4-3. I should've known better and found another (tough) cut. Yeah, that's got to be disappointing. I'd probably have run 18 lands because your bombs are so good you virtually always win if you can cast them (is there even a common answer to Rekindling Phoenix?). You can modify your deck mid-run though, have you tried that? Also, 7-2 with the Bishop of Binding pile as well. I might've forced the B/W vampires theme a bit, but I did manage to draft enough of it to make it work, although there were a lot of filler cards. I literally never cast Recover. Skullduggery I used only in the last match of the run, when it fizzled a Buccaneer's Bravado in response to Vanquish the Weak. Marven Fein was a definite MVP, there was no other card I more wanted to cast on turn 3. Legion Lieutenant and Golden Demise were also great, especially after the City's Blessing. Of the two losses, one was when I had a slow hand with only a Martyr to play, while opponent had a flyer and loaded it up with Squire's Devotion and the +1/+1 equipment. The other, I mulliganed into a land-heavy hand and kept drawing more land, with only a Martyr in play for way too long. I won the rematch though (we queued into each other again after that match). Both games were one-sided with the player going first winning. On to the next draft: P1P1, Impale, Needletooth Raptor, or Wayward Swordtooth? The deck also has some good red & green cards like Hardy Veteran, Jungleborn Pioneer, Daring Buccaneer, Shake the Foundations and Sun-Collared Raptor, as well as a Martyr as its only white card. I'm thinking either Impale (since no black cards, and I can cut black to get good black cards pack 2) or Raptor (maybe one of the red cards will table, in particular Shake the Foundations which would be great with Raptor). Yeah, I'd be between Needletooth Raptor and Impale as well. Wayward Swordtooth is asking much more of your deck than either of the other two to be a good card; and even then it's very debatable if he really is better than either IMO. I personally love Needletooth Raptor and would probably pick it over Impale, but the pick is very close. Now for a P1P1 question of my own: Profane Procession or Ravenous Chupacabra? I've had this pick come up twice for me now; picked Chupa both times and I think it's at least defensible, but the pick is very close IMO because Profane is busted if you can cast it. Dinos don't make sense to me in RIX because we get ramp cards and it's not often that one can draft a good payoff? Same goes for Enrage, there aren't that many non-rare Enrage creatures. About that pick I'd take Profane Procession without thinking and try to draft BW control. That card looks completely unbeatable. Chupacabra is great, but it's still only a 2-for-1. That can be recovered from. Profane Procession if it sticks is like a 6-for-1, completely unbeatable. Yeah it's a gold card, but what the hell, the card is so strong I'd still take it anyway. And on to the next draft! 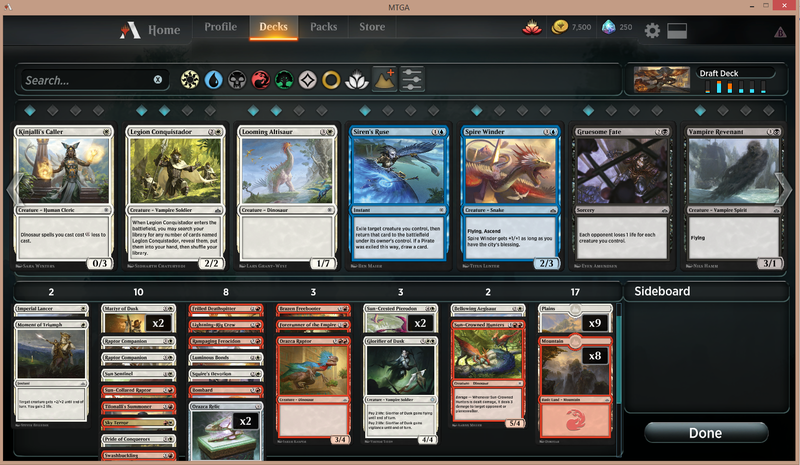 P1P1, the rares and uncommons are Arch of Orazca, Thunderherd Migration, Pride of Conquerors and Merfolk Mistbinder. The commons aren't very good either. Take the Merfolk? EDIT: Okay so picked the Merfolk into P1P2 Chupacabra and then P1P3 Vampire-tribe Forerunner, but eventually drifted into blue-black ascend. Except it was terrible. Aside from the two Chupacabras and one Air Elemental, the deck felt very mediocre. Still managed 6-3, but some of my opponents had unplayable cards, so it's nothing to be proud of. Weird thing - how come sometimes I have 10 permanents, but the City's Blessing warning doesn't trigger? Also P1P1, Azor, the Lawbringer vs. Legion Lieutenant? EDIT #2: Wound up picking Azor into 2nd pick Chupacabra into a UG Merfolk deck lol, perhaps I should've tried harder to play either of those two cards. Went 2-3 as well. Bummer. There're four vampires in the deck, not sure if they should be the ones to go or Sunrise Seeker, Dusk Charger, and probably Majestic Heliopterus. I'd pick Arch; very solid Rare that goes into a land slot. 1) You control 9 permanents, none of which have Ascend. You play an Island. You now control 10 permanents, but don't get the City's Blessing. 1a) In this scenario, you then cast Secrets of the Golden City and it resolves. You get the City's Blessing and draw 3 cards. 1b) Your opponent responds to you casting Secrets of the Golden City by killing one of your creatures. When Secrets resolves, you now only have 9 permanents in play, so you don't get the City's Blessing and draw only 2 cards. 2) You control 9 permanents, one of which is a Dusk Charger. You play your land for the turn. You get the City's Blessing. 2a) You then cast Secrets of the Golden City, to which your opponent responds by killing your Dusk Charger. You only have 9 permanents, but you still have the City's Blessing and thus draw 3 cards. I'd pick Azor as well, don't think I'd force UW if the deck clearly isn't there, though. I'd cut Voracious Vampire, Majestic Heliopterus, Anointed Deacon and Sunrise Seeker and add the Recover from the sideboard (your deck has a ton of good targets for it). Hmm, didn't really consider Arch since it seems quite narrow (only for ascend decks) but then the Merfolk lord is equally narrow, so that's not warranted. Thanks for explanation about how Ascend works! Even without other Vamps, Mavren is a 2/2 that creates a 1/1 lifelink every time he attacks, I'd consider that pretty good. Recover is a quasi-Divination that can't be played turn 3, but guarantees you a great draw step (your best creature in the graveyard). You have enough creatures that are good enough lategame (espeicially the Chupacabra) that 1 Recover is easily playable in your deck and IMO it's better than either of the 5-drops I'd be cutting. Marven Fein is still a 3-mana 2/2 with no other keywords though - he can be easily blanked. If he had like flying or menace, maybe, but without it he'll often be dying in combat. Still not convinced about Recover but let me play some games! EDIT: Went 1-3. Flooded out two games, cut a land to fit in Recover, flooded out third game anyway (10 lands to 6 spells). Yeah, gg. Two other red cards not used: Orazca Raptor and Tilonalli's Crown. I'm sort of finding 17-land decks to be very dangerous in this format. There's like, no mana sinks. Tilonalli's Summoner in this pool is a rare mana sink, but she's still only one card. Not sure of the build as well. The Summoner + Aegisaur makes me want to go wide, which is why I picked a Pride of Conquerors quite highly. 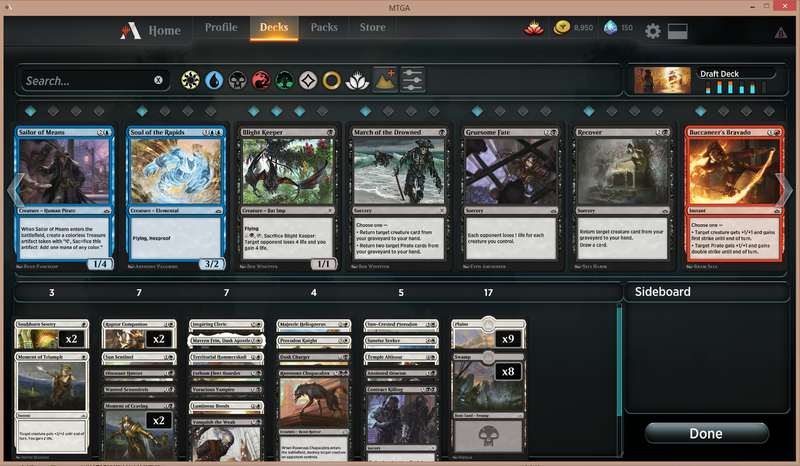 On the other hand with Forerunner in the deck I also have quite a few 1-health creatures. From first impressions my cuts would be Imperial Lancer, Orazca Raptor, Brazen Freebooter, a land and probably Sun Sentinel, but that leaves a big hole in the 4-drop slot. Crash and burned again... this format is BS! -I`m so far from building a decent deck .. I still dont know half the cards or what are good P1P1 uncommons.... I hate it! There are far to many unbeatable bombs! and removal is crap... I lost to Phoenix, Profane Procesion, and one Inmortan Sun.. I mean WTF! I had a decent curve and a bunch of Boris Dino sinergies but... no way to deal with any of those cards. finishing the closed beta as Silver 2 ... are there any news on the open beta draft schedule? Why cut the relics? They're mana rocks that turn into real cards later. I don't understand. Anyway I cut the Lancer, Sun Sentinel, Orazca Raptor, and a land, and went 5-3. One lost game opponent had Ghalta and I didn't draw Luminous Bonds (he had the "prevent all combat damage done to creatures" instant too and tried to use that to fog my 3-damage attack ...). The other lost game, I mana screwed a little on three lands and an Orazca Relic while my opponent had the nuts: 1-mana 2/2 Merfolk into 2-mana 2/2 Merfolk (3/3 if blocked) followed by 3-mana Watertrap Weaver to tap down my blocker. Finally in the last game, in a board stall I had a Pterodon and Lightning Rig Crew going, but then opponent had first Verdant Sun's Avatar followed by Zetalpa, Primal Dawn. Maybe I shouldn't have used the Luminous Bonds on the Verdant Sun's Avatar, but with it used I had no answers to Zetalpa and I conceded immediately. Not really keen to keep playing on the eve of the wipe, but we'll see. Relic is a lot worse than it looks in this format; mainly because, as you noted, the format is very low on effective manasinks. Early on you want to curve out instead of playing out the Relic turn 3, and if you lay it down turn 5 (with another 3-drop) you're effectively out of gas very soon anyway. One of Orazca Relic's best case scenarios this format is to basically replace itself at around a neutral mana cost, which leads to your deck basically having 22 spells 17 lands as opposed to 23 spells 17 lands; and if the latter configuration tends to flood out easily the former will do so even more easily (and you need 17 lands to cast relic reliably). Read: That was a BEST CASE scenario. Worst case Orazca Relic gets drawn in a hand that gets flooded, but doesn't get to 10 permanents (8 lands plus Relic versus opposing 5 lands). In that case it basically functions as an 18th land, leading to more flood. The card's not straight unplayable, but it's bad filler and that's it. Ad Recover: I might be higher on Recover than many people, but the card gives many decks a much needed manasink. It basically takes the better half of Soul Salvage or Wander in Death and mixes it with half a Divination. By far not every deck wants access to it, but basically every deck that is somewhat grindy and ideally has one or two great creatures to recur vastly profits from the first Recover (it often does get worse in multiples though). Hmm, and I consider the relics as cycling lands. They produce mana when I need them and turn into another card when I don't. Hitting three lands even with a 16-land deck isn't unusual (Frank Karsten's analysis gives ~90% probability even on the play). The risk is getting run over by the opponent while you are playing Relic, and it did happen in that one game I described, but with the deck having as many low drops as it does it's not common. I played the Relics and would probably do so again, because I'm scared of running 17 lands. Recover might be a mana sink, but it's a bad one, since you can't cast it completely until some creatures die (and the creatures that will die first are your worst ones). I dunno. I might try it again in the future, but right now I don't think I'll be playing Magic until after the wipe. If Orazca Relic was a cycling land I'd take it and play it. However, it is not. You cannot lower your land count by including it in your deck; it takes a spell slot. If you consider Orazca Relic as a Cycling land, yet are scared of running 17 lands because of flood, why are you intentionally running 18 or 19 then? Is Soul Salvage a bad card then? Gravedigger? Salvager of Secrets? Whichever other card returns cards from the graveyard? No? Then what exactly makes Recover bad? Recover's only downside is that it's a slow card, but it shares that sentiment with any and all card draw spells ever. I don't agree you can't lower your land count by including Orazca Relic in your deck. Yeah it's 3 mana, but it's still a mana source. And you're still 90% to hit 3 land by turn 3 with 16 lands. The potential mana screw issue is balanced by the fact that sometimes, you'll topdeck a Relic in the late-game and can cycle it, while you can't with a land. I would never run 18 or 19 lands in this format. I think Soul Salvage is unspectacular filler. Gravedigger and Salvagar of Secrets are good though, that's because they impact the board when they're played. Would you ever play Flood of Recollection? Flood of Recollection is bad because we don't have any great targets for it (some good ones, no great ones) and it doesn't provide card advantage. Recover does - it's basically a draw 2. I think Orazca Relic is close enough to a land that running 16 lands 2 Relics is close enough to running 18 lands, except some of the lands cost mana when they come into play. And while I agree that most decks should run 16-17 lands in RIX there are decks that may want 18 for different reasons (having lots of carddraw, splashing for bombs). I am actually currently playing a deck in which I'm running 18 and I'm 100% confident that is correct.